You've found the “U.S. 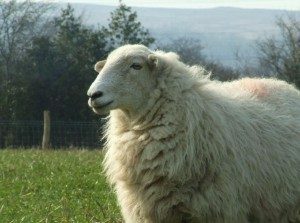 Welsh Mountain Sheep Breeders” page here at Hobby Farm Wisdom! If this is the first time you have visited our site: Welcome! Welsh Mountain is a breed of sheep that is native to the Welsh mountain region. They are a small but hardy breed that has a clean face and long tail, which are usually left undocked. Welsh Mountain rams are horned while the ewes are polled. There are a number of different varieties and color variations, some of which are considered to be separate breeds. White Welsh Mountain sheep are all-white and are the most common variety seen in the Welsh mountains. Badger Face Welsh Mountain sheep can either be white with a dark face and belly or black with a white belly and striped over the eyes. The Black Welsh Mountain sheep are all black and while one or two typically occur naturally in a flock, they are also bred specifically for this trait. South Welsh Mountain sheep are larger than other varieties.